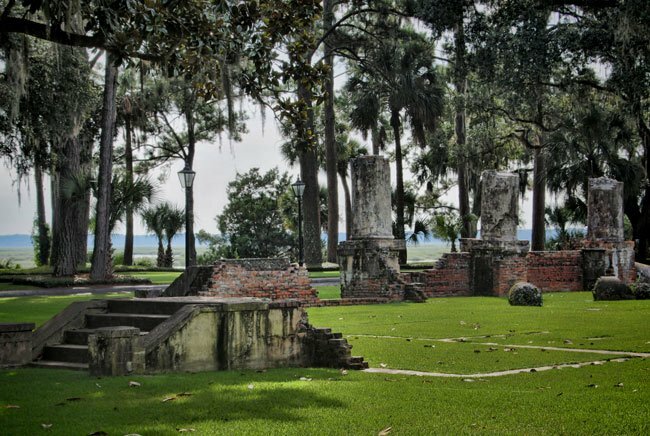 The ruins of a mansion – once a getaway for wealthy Northerners at the end the Gilded Age – overlook the May River in Bluffton. They stand on property formerly owned by New York financier Richard T. Wilson, Jr., who built a four-story, 72-room manor on the banks of the scenic river in 1902. Wilson called his land, which was comprised of 21 former plantations, Palmetto Bluff. He intended for his South Carolina home to serve as a hunting lodge, lending to the mansion’s name, Palmetto Lodge. However, his wife instead used the estate for entertaining guests, who arrived by steamboat and rail from New York and Rhode Island to stay at Palmetto Lodge for weeks at a time. During their extended visits, guests would attend opulent parties, play lawn games, and partake in outdoor recreation. Wilson’s in-laws included members of the Vanderbilt, Whitney, and Astor families. They were among the prominent guests entertained at Palmetto Bluff, and the estate was regularly mentioned in the social pages of the New York Times during the early twentieth century. In 1926 Palmetto Lodge was destroyed in a fire, leaving nothing but the stone remains seen here. Wilson died just three years later, and the land was sold to the Union Bag Company in 1937 for its 20,000 acres of timber. The company conserved a large portion of the property under a Land Use Plan. In the 1970s, the Union Bag Company acquired the Camp Paper Company, forming Union Camp. Union Camp used part of the land for a hunting retreat, fulfilling Wilson’s original plan. Today Palmetto Bluff is a planned community on the Bluffton waterfront, combining family living with conservation. Palmetto Bluff nods to its history of affluence with a luxury inn – the Inn at Palmetto Bluff stands next to the columns that once greeted the Wilsons’ guests as they arrived at the mansion. 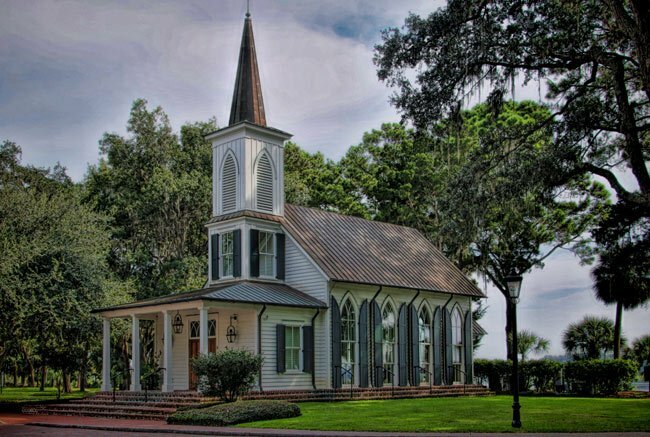 A popular wedding destination, Montage Palmetto Bluff includes its own chapel, seen above. Though the chapel is a recent addition to the Bluffton landscape, its heart pine floors were reclaimed from Piedmont Mill in Greenville.